Gain more insights into your projects, your team and your results with real-time data and reporting from our online PM software. 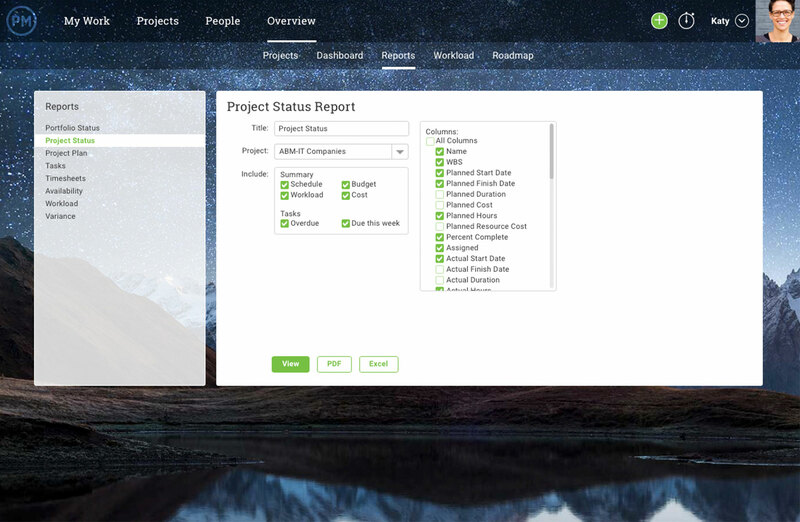 ProjectManager.com is the only cloud-based project management software that’s powerful enough to give both managers and executives the tools they need to react in real-time and get results today, tomorrow and for next quarter. Try our suite of project management tools now with this free 30-day trial. You’ve assembled the perfect team and an air-tight business model with targets that are just lofty enough. Now give yourself and your team the best tools available to crush those targets. Efficient and effective tools can mean the difference between getting the jump on the competition or coming up second, between landing the client or leaving voicemails, between barely reaching your revenue target or doubling it. ProjectManager.com gives you that edge. With real-time dashboards, unlimited file storage, unrivaled reporting tools and complete visibility into project progress down to the task level, you and your company will be equipped with modern, cloud-based tools geared for success. Give your A-Team everything they need to collaborate, be productive and follow your directives to the last detail. Give yourself more visibility and better data for more informed strategies, presentations and leadership decisions. Read on to find out how ProjectManager.com can work for everyone in your organization. Real-time dashboards provide up-to-the-second updates on everything from team success rates, business expenses to task progress. Track where each team member is in their workflow and receive updates to your inbox as tasks are completed. Plus, we even offer portfolio dashboards so you can track progress on groups of projects with one simple, colorful view that’s packed with informative graphs. Use our calendar to schedule recurring meetings, set deadlines or even schedule tasks. Our calendar links to your email too, so you’ll have easy access to important information whenever you need it. Have a big presentation coming up? Mark it in your calendar, and then use our dashboards to get relevant data minutes before. Demonstrate your initiatives and your success with data gathered with our intuitive reporting tools. Create detailed reports on every metric in the project, including expenses, task progress, timesheets, slippage and more. Then, quickly share those reports online with clients, shareholders and team members, or print them out for that personal touch. On the business edition and above, we even offer free guest logins, so you can give high-priority customers and clients a firsthand view at the progress of projects. With ProjectManager.com, we give you the visibility, data, and confidence for everything that you do. When you sign up for ProjectManager.com, you’re empowering your entire team with a software that amplifies productivity and collaboration. Our suite includes task management tools, advanced Gantt charts, to-do lists, team chat, dashboards, timesheets, resource management features and more. With our suite of management tools, managers will have more control over their business processes, streamlining execution and improving results. With Gantt charts and resource management features, managers can create project plans, precisely schedule tasks and assign workload to team members quickly and accurately. 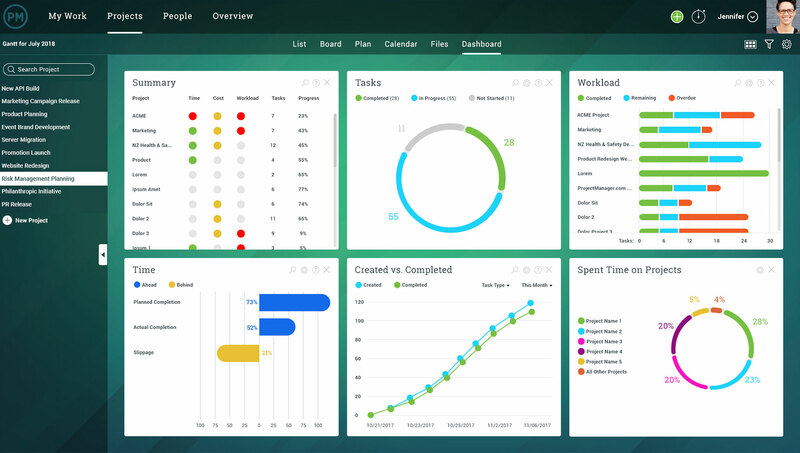 Plus, like executives, managers will have access to dashboards in order to track progress and keep everyone motivated. Team members will thrive in our collaborative project management software. With task management tools and team chat, they are able to communicate with one another and their managers in order to get all the information they need to complete tasks and get results. They also receive live updates via their activity page and email alerts, so they are aware of any project changes. Available 24 hours a day, 7 days a week, our online software gives every member of your business constant access to tools they need to accomplish their tasks and contribute to the big picture. 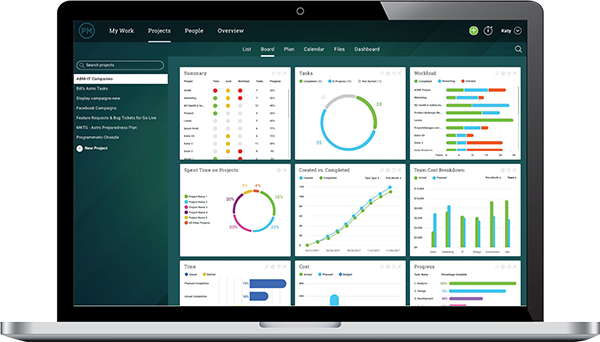 Manage a portfolio of projects, increase productivity, propel growth, foster team communication and more with the most sophisticated cloud-based project management software on the market, ProjectManager.com. When you put it all together, it’s clear why some of the largest organizations in the world — like Volvo, Ralph Lauren, NASA and the United Nations — use our software every single day. Take a free trial today and start impacting your business right now.